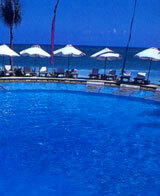 Just 25 minutes away from the bustle of Kuta or airport, you are in a Resort to Pleasure, Nikko Bali Resort & Spa. The eastern cliff of Bukit Peninsula provide shelter for a number of small Balinese fishing villages and communities that celebrate their temple festivals with music, offerings and prayer. Wonder along the seaside paths to discover the life style and traditions of Balinese people.